Suitable for a wide range of demanding industrial applications, RT temperature switches are designed to maintain a specific temperature difference between two media. The RT has a wide temperature regulating range from -60 to 300ºC. Precise scales make it easy to set the temperature range and differential. 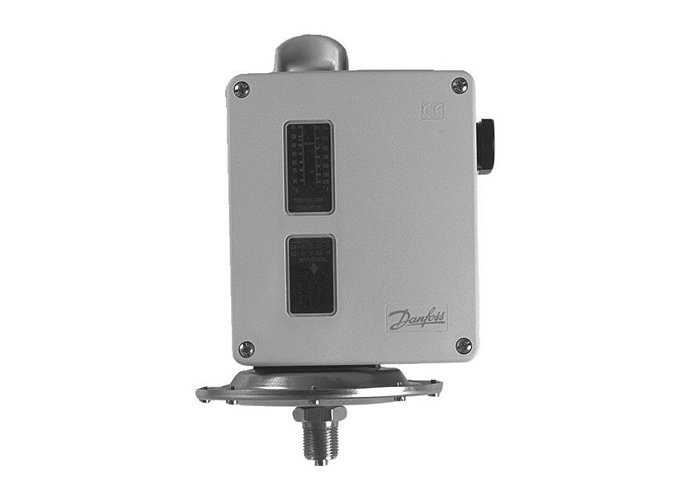 An IP66 enclosure and a range of sensor types – such as capillary tube sensors, room sensors and duct sensors – enable neutral zone adjustment and manual reset functions. RT temperature switches are available with standard contact systems for 3A, 400V AC15 loads and 4A, 400V AC3. Special contact versions are also available as spare parts. The perfect Single Pole Double Throw (SPDT) snap function minimises wear during each operation and extends the contact life. It has a mechanical lifetime of one million cycles over the full temperature range, and an electrical lifetime of 100,000 cycles at maximum load. The RT also comes with two cable entries for 6-14mm diameter cables, providing a number of possible electrical cable connections. RT controls are used in general industrial and marine sectors. The RT temperature switch series consists of a variety of room temperature switches and remote sensor temperature switches including neutral zone temperature switches. RT temperature switches are generally recommended for applications where safety or economical consequences are critical factors. RT controls have been in service for over 70 years. Temperature Range: -60 to 300ºC. Also available with gold plated contact systems. Available with external max. reset function (IP54). Contact material: Silver cadmium oxide (other contact materials available as accessories).